Follow my painting adventures on Facebook, Twitter, Pinterest or Instagram or my signing up for my newsletter here. Any questions - email me. Hello and thank you for visiting My Small Paintings. My name is Amanda and I am a British artist living in Los Angeles. One of my more benign wildlife encounters while plein air painting! In many ways I am an accidental miniaturist. I began painting small simply because I wanted a painting kit that would fit into a tiny backpack. Also my beloved dog had a short attention span so it was a challenge to loiter too long in any one place! I experimented with various sizes of paintings but settled on 2 x 3 inches because it is small enough that it forces me to distill the scene to its essence, but big enough to allow me to include details of the shapes and patterns of light that draw me emotionally into a space. I am primarily a studio-based painter and printmaker but my creative process begins with going out into nature with my sketchbook and watercolours. All my work is landscape-inspired and so in my outdoor painting sessions I am always looking for places that embody that sense of an invitation that all great landscape paintings share. They seem to be saying ‘imagine yourself here’ as they seduce the viewer into an imaginative relationship with a particular place. These small paintings are intimately connected to my larger work in many ways but especially as a declaration of my interest in the tradition of landscape painting. You can see my larger work on my personal website amandamears.com. Thanks for visiting! Have questions or comments - email me - I'd love to hear from you. 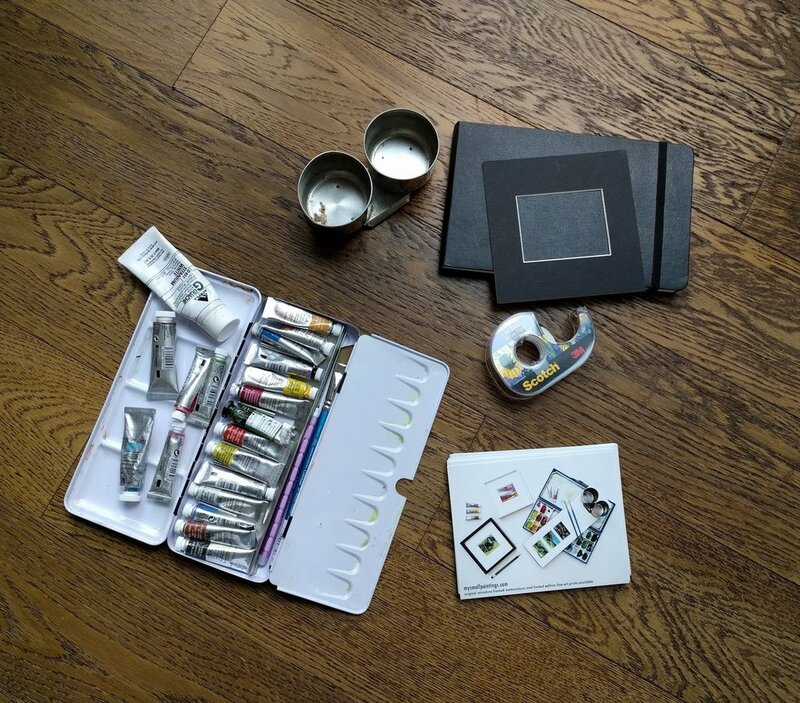 My super lightweight plein air painting kit!